Underfloor heating is becoming more popular as homeowners look for the best way to heat their property comfortably and efficiently. Improvements in techniques make this form of heating a viable option compared to traditional radiators, and there are compelling reasons why underfloor heating is worth considering. With radiators, the units themselves take up space so consideration has to be given to where furniture and other items are sited to prevent blocking the radiator and thus impairing efficient heat distribution. This also affects items like bookcases or cupboards that might be positioned above the radiator as they can interfere with effective heat circulation. With underfloor heating, furniture can be positioned just about anywhere and wall space can be utilised without having to consider where a radiator might be. Underfloor heating systems are said to be as comfortable as a radiator based system at temperatures 2℃ lower and, with water based underfloor systems, the water is heated to a lower temperature (50℃ compared to 60℃ or more). Not having to heat the water to such high temperatures paves the way for possibly using more efficient heating that uses renewable energy sources such as biomass boilers. This coupled with the way underfloor heating heats the air – the entire floor acting as a heating emitter as opposed to radiators relying on convection to heat air higher up – should make for energy and cost savings and a more comfortable environment. Underfloor systems usually have a dedicated control panel in each room so temperatures in various spaces can be totally different to one another. While many radiators can be thermostatically controlled, heating individual rooms to specific temperatures tends to be more hit and miss. Underfloor heating distributes heat more evenly so it’s possible to be warm and comfortable anywhere in the room, whereas with radiators the heat is distributed less consistently. Also, because the floor is warmed up, treading on it in stockinged feet or barefoot is comfortable whereas in a radiator heated room the floor often stays cooler for longer. This can be especially pronounced in bathrooms – underfloor heating makes for a more pleasant environment. With conventional heating such as radiators, floors can stay cold and possible dampness at lower levels can remain especially in carpeted spaces so creating an ideal environment for dust mites to multiply. Underfloor heating makes conditions too dry and warm for these pests to flourish, so people who suffer with conditions such as asthma or allergic reactions could feel a lot more comfortable. In convection heating, the circulating air tends to move and redistribute dust particles so making them more likely to be inhaled. Underfloor heating, by contrast, warms the room by radiating heat from the ground up but doesn’t disturb or move dust particles anything like as much so the air in a room is generally cleaner. Some assume underfloor heating can only be used with solid flooring but this is far from the case. This type of heating can be used with many floor types including carpet, laminates, engineered wood and more. It’s true underfloor heating works especially well with more solid floors as they can retain heat, but it’s a far more flexible option than many initially believe. 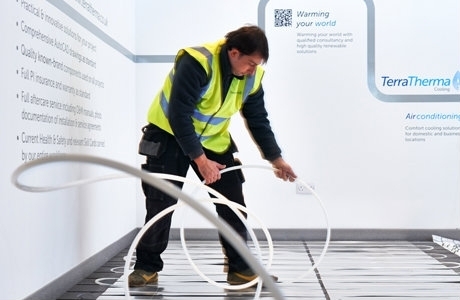 Underfloor heating is certainly catching on, but a key factor is obviously initial cost and whether this will be recouped in terms of energy savings. While careful consideration should be taken if thinking of retrofitting to an existing space, it’s certainly very appealing if installing to a new building project such as an extension or new build property. When considering an underfloor system, the decision as to whether to install a wet or dry type will need to be taken. A wet system uses heated water running through pipes under the floor while a dry system uses electric coils. What you choose will likely depend on the type of fuel used to heat the property and whether the system will be on a ground floor or higher.